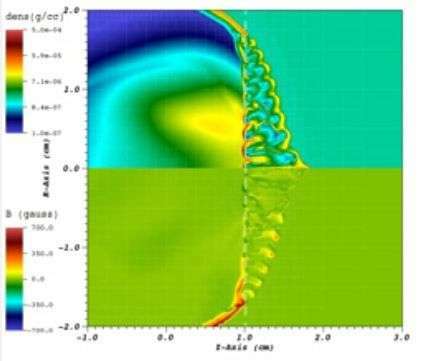 Astrophysicists have established that cosmic turbulence could have amplified magnetic fields to the strengths observed in interstellar space. "Magnetic fields are ubiquitous in the universe," said Don Lamb, the Robert A. Millikan Distinguished Service Professor in Astronomy & Astrophysics at the University of Chicago. "We're pretty sure that the fields didn't exist at the beginning, at the Big Bang. So there's this fundamental question: how did magnetic fields arise?" Helping to answer that question, which is of fundamental importance to understanding the universe, were millions of hours of supercomputer simulations at Argonne National Laboratory. Lamb and his collaborators, led by scientists at the University of Oxford, report their findings in an article published in the June 1 issue of Nature Physics. The paper describes experiments at the Vulcan laser facility of the United Kingdom's Rutherford Appleton Laboratory that recreates a supernova (exploding star) with beams 60,000 billion times more powerful than a laser pointer. The research was inspired by the detection of magnetic fields in Cassiopeia A, a supernova remnant, which are approximately 100 times stronger than those in adjacent interstellar space. "It may sound surprising that a tabletop laboratory experiment that fits inside an average room can be used to study astrophysical objects that are light years across," said Gianluca Gregori, professor of physics at Oxford. "In reality, the laws of physics are the same everywhere, and physical processes can be scaled from one to the other in the same way that waves in a bucket are comparable to waves in the ocean. So our experiments can complement observations of events such as the Cassiopeia A supernova." Making the advance possible was the extraordinarily close cooperation between Lamb's team at UChicago's Flash Center for Computational Science and Gregori's team of experimentalists. "Because of the complexity of what's going on here, the simulations were absolutely vital to inferring exactly what's going on and therefore confirming that these mechanisms are happening and that they are behaving in the way that theory predicts," said Jena Meinecke, graduate student in physics at Oxford and lead author of the Nature Physics paper. Magnetic fields range from quadrillionths of a gauss in the cosmic voids of the universe, to several microgauss in galaxies and galaxy clusters (ordinary refrigerator magnets have magnetic fields of approximately 50 gauss). Stars like the sun measure thousands of gauss. Neutron stars, which are the extremely compact, burned out cores of dead stars, exhibit the largest magnetic fields of all, ones exceeding quadrillions of gauss. In 2012, Gregori's team successfully created small magnetic fields, called "seed fields," in the laboratory via an often-invoked effect called the Biermann battery mechanism. But how could seed fields grow to gigantic sizes in interstellar space? Building on their earlier findings, Gregori and his collaborators at 11 institutions worldwide now have demonstrated the amplification of magnetic fields by turbulence. In their experiment, the scientists focused laser beams onto a small carbon rod sitting in a chamber filled with a low-density gas. The lasers, generating temperatures of a few million degrees, caused the rod to explode, creating a blast that expanded throughout the gas. 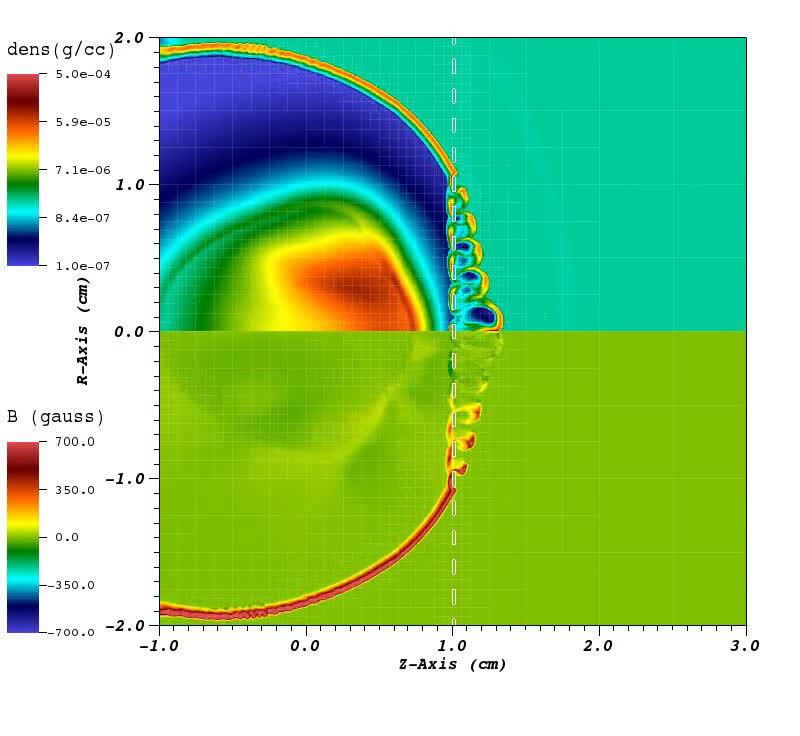 "The experiment demonstrated that as the blast of the explosion passes through the grid it becomes irregular and turbulent, just like the images from Cassiopeia," Gregori said. "The experimentalists knew all the physical variables at a given point. They knew exactly the temperature, the density, the velocities," said UChicago research scientist Petros Tzeferacos, a study co-author. Tzeferacos and his colleagues incorporated that data into their FLASH simulations. "This allows us to benchmark the code against something that we can see," Tzeferacos said. Such benchmarking—called validation—shows that the simulations can reproduce the experimental data. The simulations consumed 20 million processing hours on both the Mira and Intrepid supercomputers at Argonne. Mira, which can perform 10 quadrillion calculations per second, is 20 times faster than Intrepid. With validation in hand, all members of the collaboration could return repeatedly to the simulations to get answers to new questions regarding the physics they saw. "We could look at the velocity instead of the density of the magnetic field, or we might look at the pressure," Lamb said. "This simulation is a treasure trove of information about what's really going on. It's actually critical to understanding correctly what's really happening." "Magnetic fields are ubiquitous in the universe," said Don Lamb, the Robert A. Millikan Distinguished Service Professor in Astronomy & Astrophysics at the University of Chicago. ...So there's this fundamental question: how did magnetic fields arise?" In astrophysics, the Biermann battery is a process by which a weak seed magnetic field can be generated from zero initial conditions. Something from nothing, just like the magical big bang. BICEP2's announcement of the discovery of gravity waves is as of yet experimentally unverifiable. The experiment in this article offers an alternative explanation for that observation. The heliosphere and heliopause were measured by Voyager2 at 113au and 122au respectively, the galactic current sheet is well beyond our ability to accurately measure, possibly generated by the SMBH at the center. The interaction between the two magnetic (among others) fields of Andromeda and the Milky Way is unknown or worse discounted. "zero initial conditions" =/= "something from nothing"
We've observed the surface of last scattering—prior to that matter was hot and ionized. The only forces that would affect the motion of the hot/ionized matter (at first) were those arising from gravity and temperature gradients. Then it was Biermann batteries everywhere. Briefly, though, since the universe cooled as it expanded, and gravity quickly became the primary driver, producing the first stars and SMBHs. Actually, the increase in densities during gravitational collapse is the greatest contributor to magnetic field growth (cf. http://www.as.ute...inal.pdf ). I think that was the beginning and the end of the Electric Universe, which was unstable (as in not static) and has long since evolved into what we observe today. The amplification of magnetic fields with turbulence is quite remarkable. The only forces that would affect the motion of the hot/ionized matter (at first) were those arising from gravity and temperature gradients. Lotsa belief and assumption in your entire statement. Oddly, one need not place their toaster below the electrical outlet in the hope the current be drawn down into the "gravity well". BICEP2's announcement of the discovery of gravity waves is as of yet experimentally unverifiable. Not when the cosmos is your lab. The experiment in this article offers an alternative explanation for that observation. An exploding carbon rod? How so? Lotsa belief and assumption in your entire statement. No, lotsa observations, lotsa lotsa maths, lotsa^3 experiments, and a general consensus among minds that can understand the physics of both quantum mechanics and general relativity and their respective incompatibilities, while producing extensions of those highly successful theories, such as SO(32) and E8 x E8 heterotic string theory. Maxwell's equations are nice, but they're hardly the whole story. That's been the case for centuries, and yet when in situ measurements are taken "standard" theories require "back to the drawing board" adjustments. This has been going on since the space age began. Introduce a laser beam which turns the rod to plasma, double layers (DL) (not a "shock") immediately forms to isolate the plasma from the surrounding environment. We know from decades of real lab research that DL's (electric fields) incite electric currents which then "amplify" (create) strong magnetic fields. No magic is going on here, just real phenomena completely misunderstood by these "scientists". Carbon has a layered hexagonal lattice structure like the dense hydrogen in the sun. Dr. Pierre Marie Robitaille's Liquid Metallic Hydrogen model of the sun and his work on the solar atmosphere explains the mechanisms behind red giants and supernovas. Any model based in Big Bang is worthless and so is string theory. Plasma cosmology gets more validation every time the data comes in, without the need for multidimensional, black hole, dark energy nonsense. No magic is going on here, just real phenomena completely misunderstood by these "scientists". Between your statement and theirs (above), it's quite obvious who's closer to "complete misunderstanding." None of the scientists reported anything 'magical'. From "zero initial conditions" magnetic fields were amplified sounds somewhat magical. Because they used computer games doesn't verify anything, garbage in, garbage out. I have little doubt they think their computer games are "inferring exactly what's going on and therefore confirming that these mechanisms are happening and that they are behaving in the way that theory predicts", yet they say "The origin of the large magnetic field in the interior of the remnant is less clear". It is still abundantly clear they still do not understand basic plasma concepts as Alfven claimed over 40 years ago. Because they used computer games doesn't verify anything, garbage in, garbage out. First of all, they didn't get garbage out—the results matched what's observed in Cassiopeia. Second of all, they didn't put garbage in—they put the theory in. The results of a phenomenal number of computations validate their understanding of the theory with respect to scale, energies and observables (as mentioned in the article)—the theory reproduces what's observed, so there is an abstract, mathematical equivalence. Maybe you can do likewise with Alfven's plasma physics. If you were to do so successfully, it would be possible (on an abstract level) to show the same equivalence between your result and theirs, and between yours and the dynamics of Cassiopeia A.
Hi Protoplasmix, cantdrive. As independent observer/reader (ie, not belonging to either EU or Orthodox BBang 'crowds'), I put following observations/questions re above article. 1) They assume that there was 'beginning' as per Big Bang hypothesis. 2) They are "pretty sure" that no magnetic fields existed, based on assumed BBang "zero conditions". 3) Do they say what "initial conditions" they programmed to represent hypothetical BBang "zero conditions" states regarding charged/magnetic PRE-cursor states which could then produce magnetic fields in their hypothesized 'beginning scenario'. 4) Do they state what 'stuff' involved in their "cosmic turbulence" processes, ie, is it charged currents of matter/Quark-Gluon plasma; if so, do they mention/include such in the 'programmed maths-simulation entities/terms' that amplified the hypothesized initial/evolving magnetic fields? Or do they 'infer' magnetic fields from 'nothing'? A group of blind men describing an elephant. The article is about magnetic turbulence, like a smooth stone one can hold in the palm of a hand. The blind men still want to address the elephant in the room. First, all theories should be viewed as invalid until proven experimentally, possibly valid if confirmed observationally or discarded if they bear no resemblance to reality. Secondly, the Big Bang may be a misnomer. Instead of "the" bang, it could be "a" bang. Herein lies the problem with the cosmos being the lab. We have no control group with which to compare. The L.A.B. (local area bang) is all that we have, we can't compare it with other bangs so we can't confirm whether or not it was big. Could be we live in a WIMP-Y little bang, we just don't know. Third, didn't want to talk about the elephant yet. Now that I have a smooth stone in my hand I'll see if I can't make it skip over the pond. Lastly, if you can't explain it simply, you simply don't understand it. Alfven's plasma physics can do so, without the magic. Alfven's plasma physics can do so, with real phenomena and no magic needed. Good question, RC. I'd have asked where around Cassiopeia is there a 'grid'. "…Turbulence may be generated by hydrodynamic instability at the contact discontinuity between the supernova ejecta and the circumstellar gas. However, optical observations of Cassiopeia A indicate that the ejecta are interacting with a highly inhomogeneous, dense circumstellar cloud bank formed before the supernova explosion. Here we investigate the possibility that turbulent amplification is induced when the outer shock overtakes dense clumps in the ambient medium…"
But assuming it does, my next question is how Alfven's plasma physics gives rise to the observed matter/antimatter asymmetry in the universe. Ok, you can stop there. The only way in which you can claim that you are in any way correct is if you say that these forces are not completely understood. Just as it is extremely difficult to explain even the concept of Torque. Go ahead and take a stab at it, if you would care to, cd85. All that aside, the force which we call magnetism could be a similar phenomena, and the generation of electricity as electrons move through a magnetic field may be just such an example of force generating an anti-force, simply as an effect of the properties of fundamental particles. Your pet theory doesn't fit the observations, either way. Hi Protoplasmix. :) Thanks for your couteous and informative reply. That excerpt describes 'evolved' plasma/interaction states. Unfortunately, doesn't answer question about what 'stuff/processes' was assumed for hypothetical Big Bang "zero conditions" states/entities programmed 'starting conditions' for simulation? Why must I restate that which has already been solved. Ignorantia scientia non excusat! given your "expertise" in EU and your knowledge of Alfven, as well as your physics background, there is a no brainer solution AND it is simple enough to prove as well as beneficial to you: how about you publish your findings in some reputable relevant magazine... like, say AAAS ScienceMag? Stay away from IEEE as it has an incredibly low impact on cosmology. AAAS has a better circulation as well as a better impact, and it is routinely referenced here at PO so we would see when you published. with what you've said, you probably don't even need to do any experiments as they've already been done, right? because, judging by the article above, someone didn't get that memo! IF you publish now, you are SURE to a big hit! Assailant: I didn't know that was illegal officer. Officer: Oh, well I guess since you didn't "get that memo" that makes it OK.
Willful ignorance is no excuse. BTW, if I were to publish that which I constantly remark on it would be plagiarism. So, you're a knowledge snob and remarkably ignorant as to how "science" works. Those responsible for peer review at the AAAS wouldn't understand it anyway, they specialize in theoretical ionized gases rather than real plasma phenomena. It would have been proven in a court of law that a certain "science" journal practices censorship if they would not have settled out of court. Did you get that memo? you fear public ridicule for publishing a known pseudoscience. It's ok, I fully understand your hesitation. I would, however, like to remind you that you are doing it all here just the same... and that you and your cronies all have the same pseudoscience in common. Its called unsubstantiated claims based upon delusional beliefs where the facts are manipulated to fit the belief, rather than vice versa. I figured you would not even try. that would be admitting to the fact that your delusion is wrong. thanks for admitting that here. Needless to say, I've skipped rocks smarter than you Stumpy. Two posts back to back and nothing of any substance whatsoever. Willful ignorance is no excuse. so... if willful ignorance is no excuse, why do you keep posting? Again, I CHALLENGE you to publish a report compiling the research of Alfven et al from your pseudoscience site and get it published in AAAS as valid cosmology. I challenge you to take your pseudoscience claims here at PO and get them published in ANY reputable journal with a high impact in cosmology.